Classic Medallics, Inc. is a third generation family business spanning over 60 years of product leadership in manufacturing a wide variety of Awards and Gifts. This is a business-to-business website and do not sell directly to the public. You will need your Dealer Login Password to be able to see your dealer pricing and place your order online. If you have any further inquiries, please e-mail all your questions to sales@classic-medallics.com. Thank you! 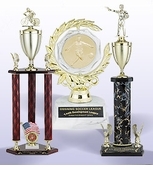 Trophies with interchangeable Trophy Figures and Risers holding 2 inch Medallion Inserts, offering 106 unique trophy designs covering every Sport or game. 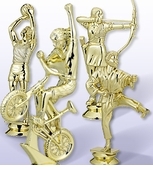 Interchangeable Trophy Figures and Trophy Risers holding our 2 inch Medallion Inserts are used on our Traditional Column Trophies. We show 78 of the most popular Trophy Figures covering every Sport, Game and Activity for both male and female Subjects. 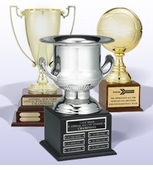 Metal Trophy Cups, Loving Cups and Sport Ball Trophies . 7 different style Cups with and without figure tops totaling 66 items. Cups come in Gold and Silver mounted on wood bases. Trophy Cups, Loving Cups and Trophy Sport Balls : Click to see all (5) sub-sections. 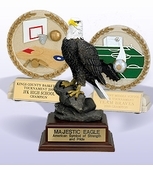 Resin Trophies, Cast Stone Trophies, Electroplated Resin Trophies 188 unique trophies covering every sport, games, school subjects, military services, mascots, eagle, academic disciplines, occupations and special recognition trophies. 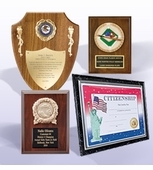 Award and Recognition Plaques and Certificates 290 plaques consisting of plaques holding 2" medallion inserts, Silk Screened plates, Digital Sport Photo Plates, Cast Stone medallions, Achievement Certificates, Photos, Eagle Mounts, Perpetual plates, and clock plaques. All plaques can be laser engraved or mechanically engraved. Interchangeable Medallion Insert Discs 400 medallion insert discs that get applied to trophies, medals, mugs, and desk items. Consisting of stamped inserts, etched enameled inserts, embossed litho printed inserts and Mylar inserts. They cover sports, academic subjects, music, art, drama, occupations, government agencies, country flags, military logos, sales achievement, employee recognition, mascots, and animals. Medallion Insert Discs : Click to see all (11) sub-sections. 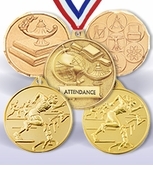 AWARD and Achievement MEDALS in gold, silver and bronze. 380 different medals consisting of sports, academic, music, general achievement, military, occupational, and custom medals. 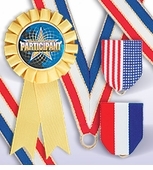 All medals can be purchased with or without ribbons and can be personalized by engraving or imprinting. Award Ribbons and Neck Chains Grosgrain and satin award ribbons: Pin back ribbon drapes, neck ribbons, satin rosette and pinked top imprinted satin ribbons. This selection consists of 7 different style ribbons, 38 color combinations, totaling 140 ribbons. Add the ribbon or chain to the medal you select. 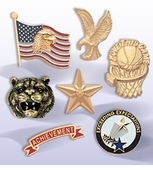 Award, Recognition and Service Lapel Pins Consisting of pins for sport, corporate, academic, music, star achievement, length of service, patriot and military, engraveable, mascot, custom, motivational and recognition pins. 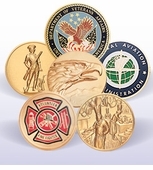 Award, Recognition and Service Lapel Pins : Click to see all (10) sub-sections. 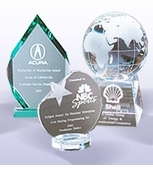 Glass, Crystal, and Acrylic Trophies This section consist of Jade colored glass trophies, glass with piano finished wood bases, optical cut crystal, paperweights, and acrylic trophies with colored accents and decorative bases. All items can be laser engraved or sandblasted. 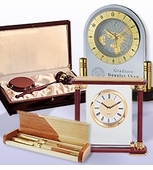 Executive and Employee Awards and Gifts Includes Desk award clocks, engravable pen sets, keepsake boxes, gavels and gavel sets, and additional desk accessories. ll items can be personalized by laser or mechanical engraving. 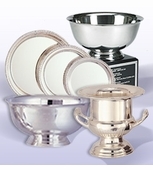 Prestige's Hollowware Awards and Trophies Consisting of Paul Revere Bowls, Wine Coolers and Award Trays. Both high polished stainless steel and silver plated items. All products are engravable with both text and logos. Prestige's Engravable Hollowware Awards and Trophies : Click to see all (2) sub-sections.